Heavy rains caused NIS 30 million in property damage and will generate NIS 20 million in work - and that's just the start. 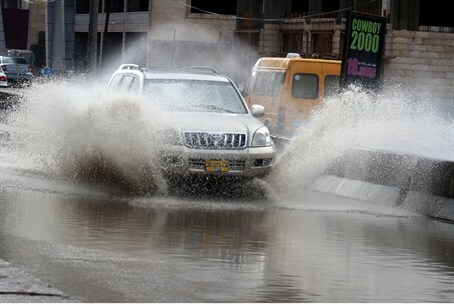 The heavy rains of the past days, especially those of Wednesday and Thursday, caused NIS 30 million in property damage, the Israel Contractors' Association said Thursday. In addition to the damage costs, contractors can expect NIS 20 million in orders for repairs for leaky roofs, damaged buildings, and so on. That, however, is a preliminary repair and damage forecast; the damage could rise considerably before it's all over. Weather forecast predicts heavier snow Thursday night and Friday night, along with plummeting temperatures and high winds. It's impossible to tell how “successful” the winter will be for contractors and repair people, as it is only the second week of December, and there is a lot more winter to come. According to Eran Siv, Chairman of the Association, “the biggest damage was done to roofs that were damaged by the wind and rain, causing leaks into buildings. In many cases, residents of homes discovered that they had leaks that they had not been aware of, due to the intensity of the rain. There was also a lot of water damage, because it was impossible to get to the areas to be repaired immediately, so the leaking water kept piling up,” he said.